Momos is a popular Tibetan recipe.Traditionally they were made of minced meat but now a days momos have filling of vegetables,Paneer,etc.They have now become favorite street food of North India .Normally Momos had three varieties :steamed,fried and pan fried.Steamed moms consists of minimum oil so they are very popular. 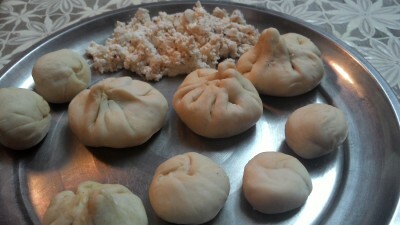 Earlier i had posted veg momos but today i tried paneer momos and my family loves it a lot. Try out this delicious street food : Paneer recipe. 1.Take maida, salt, oil in a bowl. Add water and knead a firm dough. Keep it aside for half an hour. 2. Heat oil in a pan. Add onions and green chilli, saute for a minute. Add paneer, salt and red chilli powder. Cook for 2-3 minutes. Stuffing is ready. 3. Divide dough into 12 balls. 4. Roll each ball into thin circle of 3-4 inch diameter. 5. Place paneer stuffing in between .Start folding and forming pleats. In end join all the pleats to the center. 7.Heat water in steamer or idli maker.Put all momos in greased steamer in such a way so that they dont touch each other. 8.Steam momos for about ten minutes.When momos have transparent look and they did’nt feel sticky,it means they are ready. 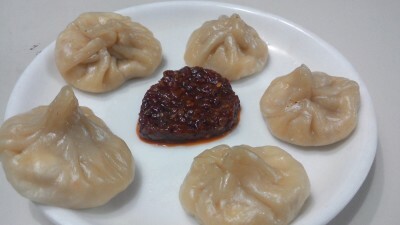 9.Serve momos with chilli garlic sauce or schezwan sauce. This entry was posted in Anupama Magic, Indo chinese, Snacks, Street foood and tagged maida, steamed dish, tibetean dish. Bookmark the permalink.